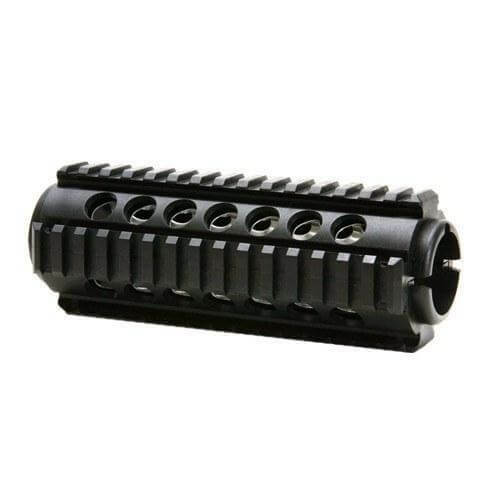 Drop in replacement quad rail handguards for carbine length AR15s, for use with carbines using a Front Sight Base and Delta Ring. These handguards are made of an impact resistant fiber-reinforced nylon, with aluminum heat shields. Thanks for sharing your feedback, Stephen. We're glad you're satisfied with your purchase. Cheers! Thanks for sharing your feedback, Joseph. We're so glad you're satisfied with your purchase. Cheers! Fits tight looks great, great product, great company to do business with. Everything fit. No modifications required. Verry satisfied. Tight fit, no rattle or shaking. Would buy again and recommend. Good product and cant be at the price. Thanks for sharing your feedback, Jason. We're glad you're satisfied with your purchase. Cheers!